They say there is always a little lock to a girl's heart and you just have to find the key. That is exactly what this necklace from Petit Chat shows. Fortunately the key is not included. As with all other recent release from Petit Chat, there is always a HUD which give you lots and lots of customizations to change the various components. Look at how it look on Kitty. Even despite the flashy blue kimono, the little red lock still can be seen clearly. Of course, if you want to unlock Kitty's Necklace, you will have to find the key which she might have throw into a multi dimensional portal somewhere. 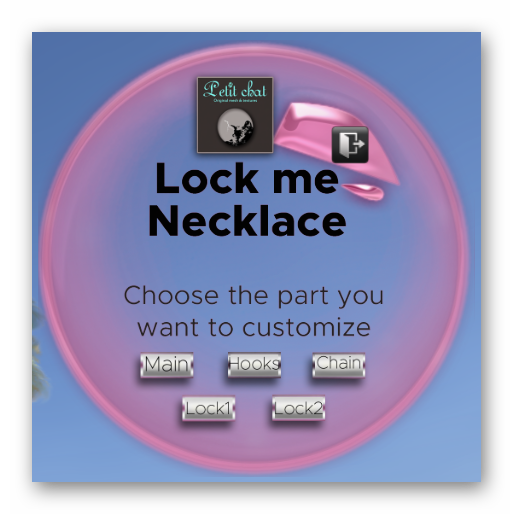 Bring a torchlight and get yourself locked with the Lock Me Necklace today!